At the moment, there’s more to be said, and talked about than I can say and talk about. In the interim, another picture. Myself, 1996. 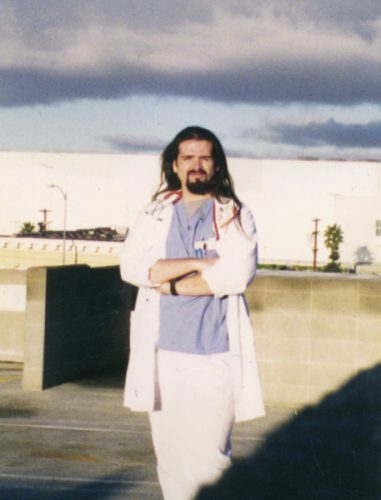 I took this with a timer, after the night shift (1900-0730) at California Hospital Medical Center — the parking garage. I believe the white building in the distance behind me is the L.A. Convention Center, but I’m not 100% sure. I like this picture. I look determined. You can see my Littman stethoscope, and the blue endotracheal tube wedge. Different tools for a different profession. Joe Crawford blogged this at 7:37am in 2002 in June. The 12th was a Wednesday. You are reading this 17 years later. Comment. There are no comments Tweet. Send email. It has hashtags→ Californa Hospital Medical Center photos respiratory-therapy .